The plan is in motion, and all of Zendikar hangs in the balance. Chandra is ready to do her part, and so is Kiora—but if Zendikar is to be saved, the Planeswalkers must execute the plan flawlessly. The air smelled ancient, disintegrated, as if even the dust granules from Ulamog's wake had fallen apart into tinier and tinier pieces until Zendikar's ruin was a film spread across the world. Chandra slashed the air with arms ablaze, drawing the attention of a hundred-foot-tall, life-consuming titan. This was, in fact, on purpose. Somehow, an impossibly short number of days ago, she had been graced with the prestigious title of Abbot of Keral Keep. She wondered what her title would be now. Something like Bait, First Class. Chandra brought up the rear of one of two groups of Zendikari, the one assigned to Ulamog. As the crowd of kor, vampires, goblins, elves, and other allies marched toward the meeting point, they kept their eyes on the titan over their shoulders. She couldn't blame them. The plan involved being as noticeably, tantalizingly alive as possible, in front of a being made to ingest life. In the distance, Chandra could see Gideon at the front of the other half of the bait army, coming from Kozilek's direction. His sural flashed in the sun, a focal point for the Zendikari who followed him. Chandra wondered whether Kozilek even saw Gideon's weapon, or just saw the morsels of energy who followed it. Directly in the path of the two titans stood Jace and Nissa, like ants standing in the path of two trampling giants. This, too, was on purpose. Chandra could just see Nissa, standing in silhouette at the crest of a rocky hill, working with Jace to prepare the spell that would save the world. Jace's warning came before Chandra heard the chittering. "Chandra, we'll deal with them. Keep Ulamog moving as best you can." A wave of Eldrazi drones scrabbled into the path of the bait army. Her group couldn't afford to slow down to engage them, and Chandra couldn't clear them out from her position at the rear. She could only hope Jace was right. She looked up and ricocheted two spiraling blasts of fire off the uncrackable faceplate of Ulamog. "Kiora, there's a contingent coming from the south. Can you contain them?" Kiora stood tall, gripping the bident tightly. Waves of seawater flowed and bounded around her like dolphins, lifting her and carrying her across the Halimar Sea and onto the land. She passed the base of the hill where the mind mage and the elf stood, and nodded at Jace. She pointed the bident and swept up onto the grassy plain, facing the shard-crowned drones and multi-legged processors head-on. The Eldrazi swarm would intersect with the pyromancer's flank. At a tilt of the god-weapon, a wall of water swung around her like a sea god's punch, thrashing the crawlers back over the ridge and into a ravine. Kiora pivoted on a jet of seawater to check for other stray aggressors. For the moment, the soldiers' path was clear. "Contained," she thought back to Jace. Kiora looked up at one of the landmasses that floated over the continent, an airborne island that shed a continuous waterfall of mist. 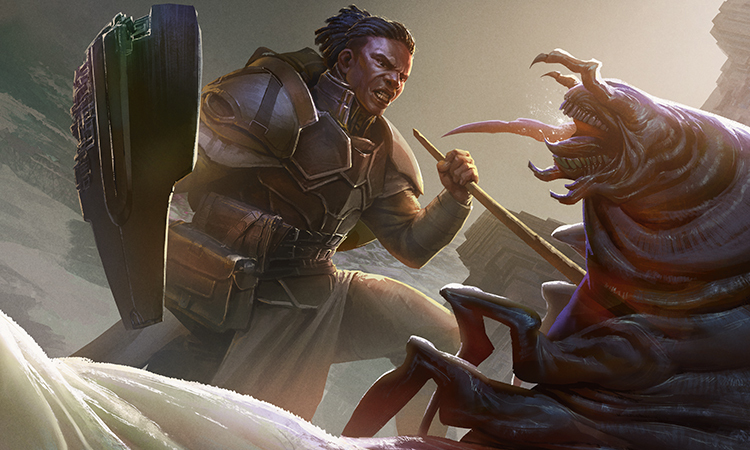 A shadow passed over the landmass, and Kiora checked over her shoulder—it was cast by Kozilek, his massive bulk stealing sunlight as he approached. She understood the nature of this so-called titan now. It was no personified god, but a distortion phenomenon that was intruding from the Blind Eternities. It was nothing but a sick hoax playing out in the fabric of the world. Not a trickster, but a trick. The luring plan was working so far, but then, that was the easy part. The mind mage and elf had the crucial job—to gather Zendikar's leylines without the use of hedrons, and to bind the titans with them so that the leylines themselves would drain the colossi away. It was makeshift magic, unrehearsed and dangerously intangible. Even worse, the very act of pulling an Eldrazi titan fully onto the plane was unprecedented. The other Planeswalkers had no idea of the magnitude of these cosmic forces of the Multiverse, or of the damage they could cause. Even the elf, who claimed to have a personal connection with Zendikar, could not possibly grasp the impact it could have on the world. One guess stood between victory and ruin. But Kiora would be glad to be rid of the Eldrazi forever. She would wait, and she would see. Kiora ascended on a pillar of water to survey the battlefield. In the distance, past the ruins of Sea Gate, she could see the ragtag Zendikari armies approaching, and beyond them the two titans. And below her, on a small hill overlooking the briny valley of the Halimar Basin, stood the mind mage and the elf. The elf who believed she could be the key to everything. Nissa was the key to everything, and Chandra knew it. The two bait armies merged, crossing directly in front of Nissa and Jace. "Chandra, Gideon—that's far enough. Disperse the army. The titans are in position!" Chandra thrust her fist into the air, sending a firebolt sizzling into the sky, where it crackled and exploded high overhead. When the Zendikari saw the signal, they began to scatter. Chandra ran alongside the others, throwing more flares into the sky for good measure. Gideon caught up with her, and they ran together up the side of the basin as the ground began to glow with soothing green light. Chandra looked behind her, up at the rocky overhang, to see Nissa scintillating with magic. The signal flares were reflected in the crests of Kiora's waves, looking like a sea on fire. She swiveled to see the titans stepping into the valley, the meeting place, the trap. And when the elf lit up, Kiora took a breath of dust-hazed air. Vines of bright, verdant magic became visible, crisscrossing the land from horizon to horizon. They curled and stretched and rearranged themselves, coiling in toward the elf. The ground under Nissa's feet rippled with light, and Kiora saw that same light shining from the elf's eyes. All at once, the pattern fell into place. A tripartite glyph a hundred feet wide appeared on the floor of the valley in fierce green fire. Miles-long loops of pure mana blossomed from the glyph, lashed themselves around the titans, and pulled. Kozilek and Ulamog tried to lurch away, to wrench themselves free from the land—and they did not just lurch back, Kiora noted, but up. The entangled titans drew themselves up to their full heights, and for a long moment, as winds lashed the landscape, it looked as though they would simply pull free of the leylines. The slack in the loops of mana disappeared as they pulled higher and higher. But then the leylines snapped taut. They held fast, straight lines anchoring the titans to Zendikar. The Eldrazi titans' shriek was tectonic. The earth slid, ripped, and undulated. 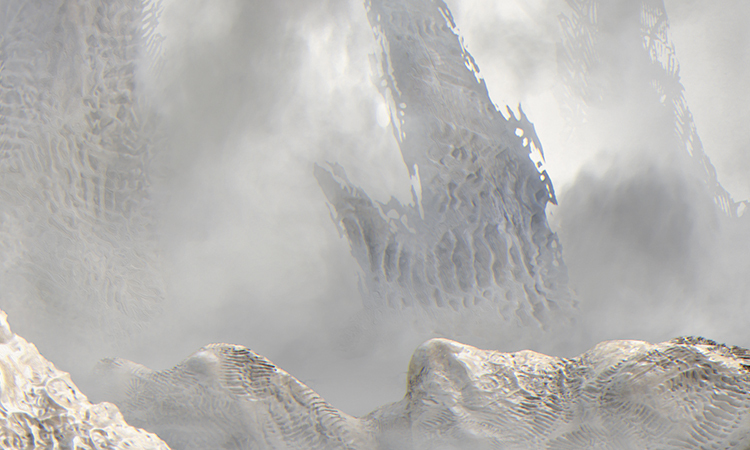 Cracks erupted in the ground and shards of broken terrain tore their way to the surface as the land bucked and heaved. The elf's spell had actually managed to make contact with the titans, and this was their reply—the kind of reply that broke worlds. All around, Eldrazi attackers appeared, jaws clacking. Kiora swept up onto a new outcropping of land and pushed back a wave of marauding Eldrazi with her own wave of seawater. As wind whipped at her fins, she called on the mana to summon a leviathan to her side, but she could feel the land resisting her call. Almost every drop of mana was being soaked up before Kiora could draw on it. 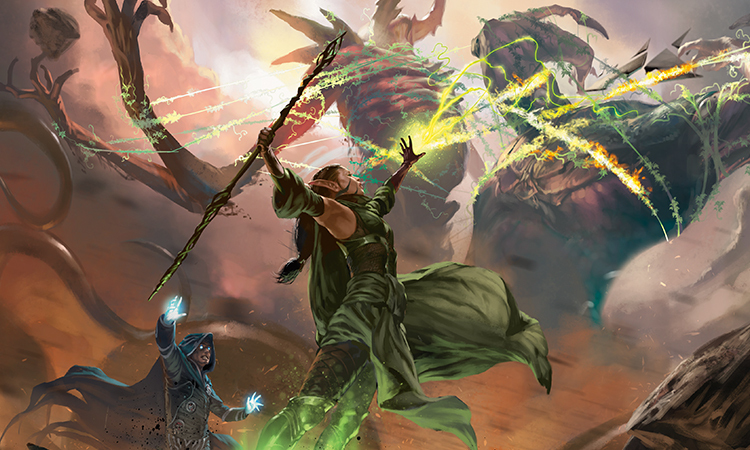 The elf's spell held the titans in place, but at the cost of absorbing all of Zendikar's mana. Would she let the land go to ruin to trap them? "Nissa!" shouted the mind mage over the winds. "Pull them! You have to pull them onto the glyph, to drain them!" Kiora saw the elf straining, her arms outstretched, channeling the leylines through the spell and through herself. She swept her arms from ground to sky, and a fresh set of leylines lashed onto the titans. The land lurched with effort. Something deep in the earth cracked, but somehow Kiora heard the sound coming from overhead. Their heads inflated and curved into elongated necks that rainbowed across the sky. Their faces widened, curved concave, and unfolded to the horizon and back again. And then it began raining Eldrazi. This is new, thought Chandra. The sky of Zendikar had become the titans. Their forms had enveloped everything, a dome of bruise-colored flesh and bone sheets and void-edged shards. Rather than the titans being pulled into Zendikar, it felt as if Zendikar were now inside the titans—or that, somehow, dimensionality had inverted, and now the outside of their enormous bodies was in every direction Chandra could see. Ulamog's upper body still rose over the battlefield, but its limbs and tentacles projected out incongruously from various points across the sky. A portion of Kozilek's crown was stretching and rotating across the coarse firmament like an insane moon. Boundaries muddled and entities merged. Otherworldly tendrils reached down out of the magenta heavens, contorting and stretching, and dripped toward the ground like funnel clouds. 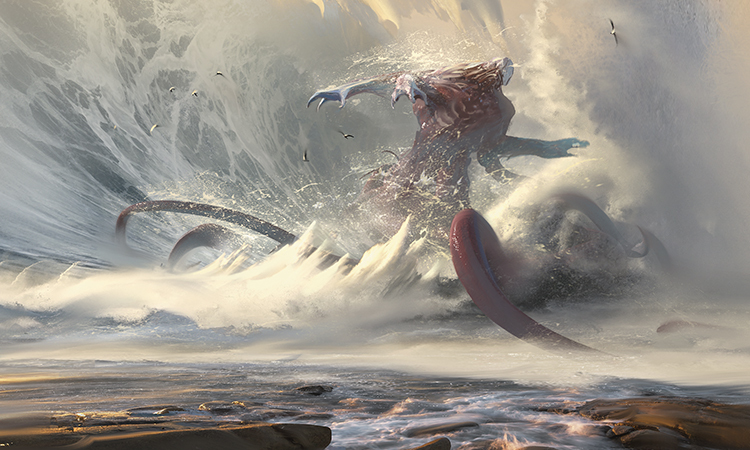 Eldrazi emerged and unfolded from each offshoot, dropping onto the land with either graceful landings or messy crashes. Chandra ran into the new Eldrazi throng, slashing with her forearms and cutting a hot swath through them. 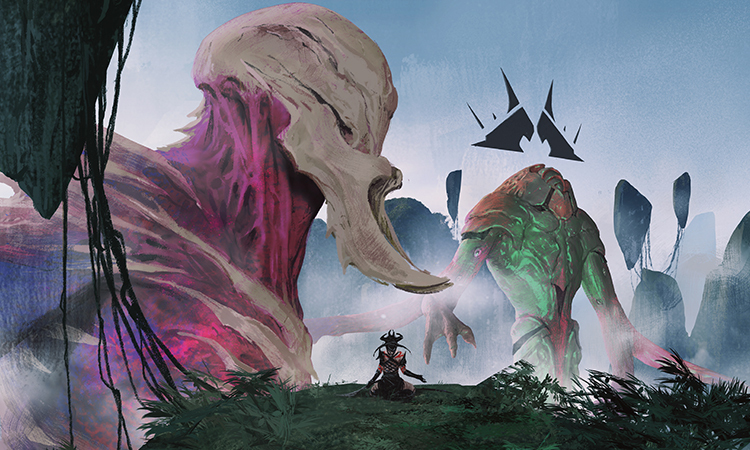 Distressingly, it appeared that the mass of Eldrazi were all still gruesomely connected to the two titans. In fact, it looked as if she was trying to cut into two enormous, cohesive, sky-filling entities, far more vast than either of the titans had been. She could see Gideon's sural sparkling and hear him commanding the Zendikari. 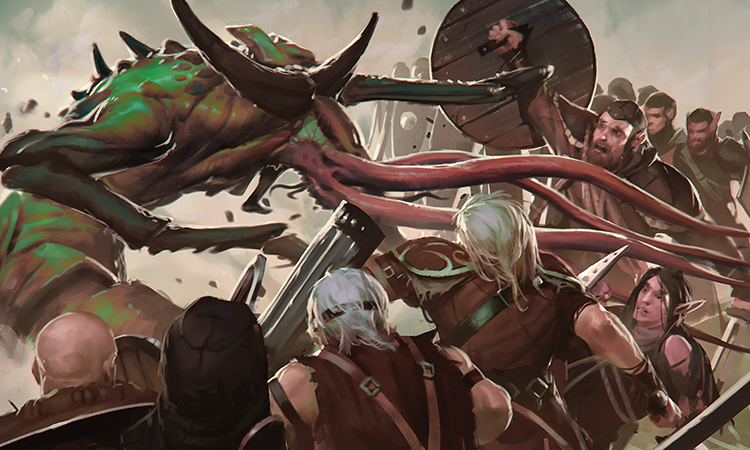 There were battle roars as soldiers rushed forward to push back this new force of Eldrazi, and screams as the soldiers were torn apart. Behind her, she heard Nissa cry out. "Nissa!" Chandra yelled on impulse. But it was drowned out by unnatural gales and the sounds of battle. Nissa's eyes had gone blind with shimmering green, and mana spread out from her in straight lines to the sky in every direction. The leylines pulled upward on the glyph, and in the process, pulled on Nissa. 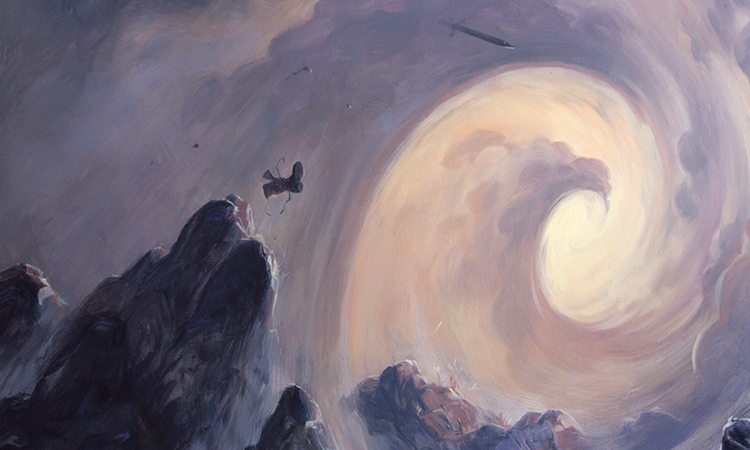 Chandra saw her lift into the air briefly, dragged up toward the titan-filled sky. She fell back down onto the ground on her knees, arms shaking, teeth gritted. "Jace," Chandra yelled, "she can't sustain this!" "It's working!" Jace yelled. "Hold on!" "Working?" Chandra spat. "How can you say that?" She blasted back a few Eldrazi intruders that were crawling toward Nissa. The land folded violently. Scores of Zendikari fell to the ground. Chandra saw cracks open up across the valley, widening and swallowing the land, shaking the outcropping where Jace and Nissa stood. Above, something new was happening to the titans. Kiora looked up at the tendril-dangling membrane the titans had become—and she could see the cracks spreading across their forms. The glyph spell had formed a connection between the titans and Zendikar, and the leylines were slowly, gradually eroding them. They were beings of the Blind Eternities, and being dragged fully into this reality was tearing at their very existence. The titans, finally, were beginning to break. 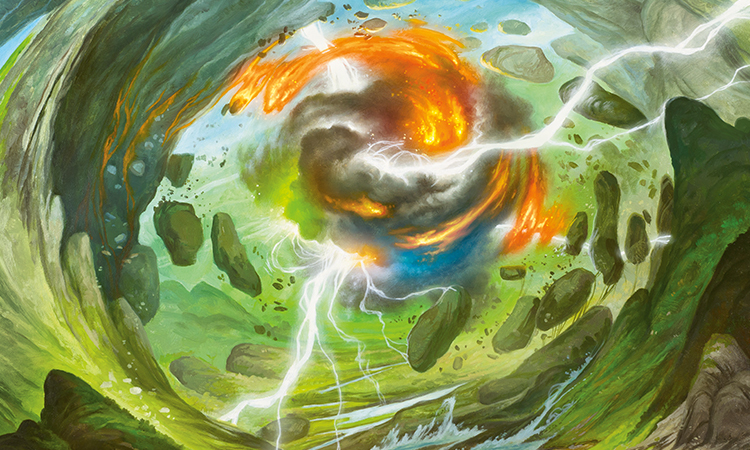 But at the same time, the land of Zendikar was breaking as well, and far more rapidly. The air was a storm of broken gales. The sea was swirling into waterspouts. Kiora knew that the land under their feet would be the next to dissolve. Kiora gripped the bident, feeling its power grow in her hands. She sensed the sea rising, gathering, answering her call. But she could sense its depletion at the same time. 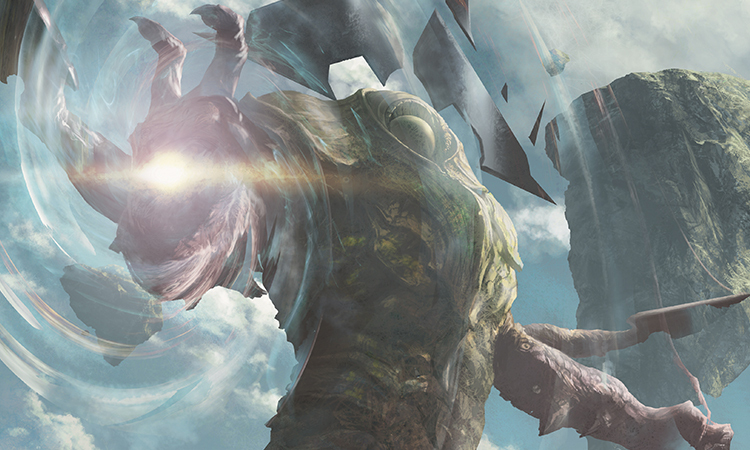 Zendikar was being set against the titans in a contest of consumption—and the titans were designed to consume. The mind mage looked at her, and she heard his words echoing in her mind. "Now, Kiora. Use your waves and clear the hordes. Give Nissa more time." Kiora swung the bident this way and that, and seawater crashed back against the encroaching Eldrazi. But she saved one final spell for one final juncture. As she battled back the swarms, she watched the landmass floating above her, the same cascading island that she had seen before the spell began. As long as the land masses, those hallmarks of her world, stayed aloft, she could give the elf more time. Chandra's fingers felt itchy. As the land broke apart below their feet, the titans moaned and thundered above. Fissures ran through their forms like widening, jagged stripes across the sky. They didn't just look horrifying and sky-encompassing. They also looked, for the first time, vulnerable. She caught Gideon's eye as he ran past, slashing two Eldrazi drones into pieces. He glanced up at the sky as well. "If we could ever hurt them, now's the time," he said, and leaped up past her, toward the outcropping where Nissa stood. Chandra's hands became fists. She had done her part as Bait, First Class. It was time to contribute something more final. "Jace!" she shouted. "Let me take them out! Let me burn them to cinders!" "No!" said Jace down at her, aloud and in Chandra's head at the same time. "Remember? Any damage to the titans or to Nissa will snap the leylines and collapse the glyph spell. We'll lose them!" Chandra held out one hand, and it became white-hot fire. "Not if we make one spell count." "I said no," Jace thought at her. "Just keep those Eldrazi back!" As Kiora saw the floating landmass begin to tip and sink out of the air, her heart sank with it. It tumbled down, spinning its waterfall in a spiral, and collided with the chaotic sea, breaking into an explosion of whitewater. Kiora scanned the sky, and saw that other floating landmasses were also falling all around her. They fell in slow motion, rolling in asymmetrical somersaults, ramming into the ground and blasting up cataclysmic plumes of dirt. We have failed, thought Kiora. She could see it now. The titans were connected to the fate of Zendikar now. 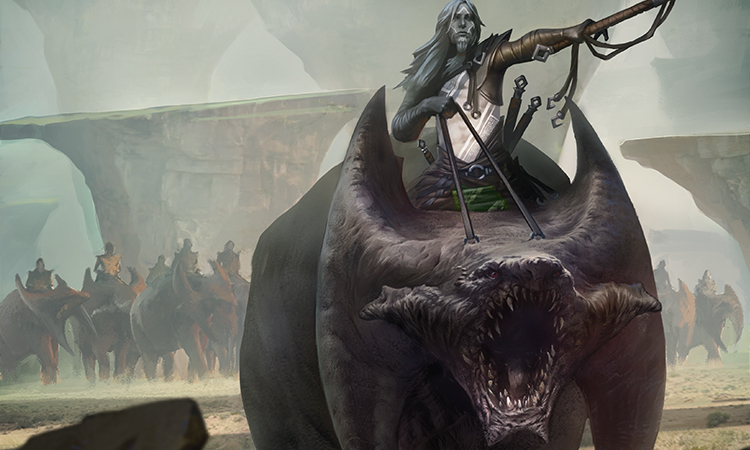 Under this elf's magic, the titans would only die if Zendikar did. "Revane!" she yelled at the elf. "It's the end. Let them go!" Nissa twitched her head blindly. The elf was still maintaining the spell, but Kiora could tell she heard her. "What?" said Jace. "No! Kiora, you have to keep the swarms at bay! We need to let the spell finish them!" "Won't work," Kiora shouted, clutching the bident and pointing it straight out to one side. "We did our best. But Zendikar will perish if they do." She pointed the tips of the bident at the sky full of titans. "They already want to leave. Let them go. We can fight them again someday!" Nissa was shaking her head as her body stretched out with the leylines, lines of worry creasing her forehead with sweat. Jace's cloak billowed in the whipping wind. His face was severe. "They must be destroyed—here, and now," he shouted. "Or we're just dooming every other world, risking millions of lives." The poor mind mage didn't see it. He was willing to commit to his mistake, even if it meant all of them dying. "We're about to doom this one," Kiora said. "The world is falling apart. Soon we will, too." "Let the plan work," Jace said firmly. She grasped the bident, and willed the waters to come to her aid. "If you won't end this, Beleren," she said, "then I will." Chandra's fist was ablaze and her eyes were locked on the sky. "Jace, let me burn them!" she shrieked. "No!" shouted Jace, whipping around to her. Chandra saw the merfolk Kiora sweeping past on a wave of water, holding her bident weapon aloft. "We've taught them a lesson," she shouted. "They won't return. It's time to set them free." Gideon was climbing up onto the outcropping to protect Nissa. "I'm with Chandra," he said, his voice strong over the churning winds. "We can't let them go, but we can't hold them like this. We forfeit lives every moment." A broken landform spiraled in toward the outcropping, slamming into the basin near the glyph. The ground ruptured. "Decide...soon..." Nissa managed through clenched teeth. The merfolk Kiora was breathing heavily. "You will drop the spell, elf," she said. She raised the bident high, and Chandra saw a tower of waves thundering up from the Halimar. "You shall set them free. And if you won't do so willingly..."
A wall of water three miles wide rose into the air. It swirled and twined into a single mass, a floating, shimmering shape shot through with sea plants and coral and fish. It was a seawater globe, hovering overhead. Kiora had emptied the entire Halimar Sea, and was holding it through the strength of her will. Her gaze was fixed on the outcropping above Chandra, on the source of the spell—on Nissa. "Chandra, can you do this?" came Jace's hurried words in her mind. Chandra's fist glowed like a tiny sun as she looked back and forth between Nissa and the Eldrazi firmament. She wanted desperately to flood the sky with fire, to unleash her fury on the abominations that would threaten her friends. But she wasn't sure she could create such a singular blast. How could anybody be sure? "I think so!" Chandra thought back. "You have to be certain. Tell me now." Chandra saw Nissa's face turn down to her. Somehow the elf's blind green eyes had found Chandra, and even with the chaos all around them, Nissa nodded. Somehow she knew it was possible, and in that moment, in that bond of trust, Chandra knew it too. "I'm certain," Chandra thought at Jace. Kiora held the sea god's bident straight up, like a sword ready to strike. She reared back, and the water reared back with her. And with one bodily motion, she hurled the entire sea at Nissa. —But the sea split in two, and each half split in two, and each resulting half split and split again, and the mass of water dissolved and dispersed into mist. Water roared down, sweeping away Eldrazi creatures. Sea life splashed down, flapping. The mind mage stood between Kiora and Nissa, his eyes glowing with power under his hood, his extended hand edged with crackling blue magic. Kiora did nothing for one stunned second. Then she bellowed, not words but inarticulate sounds of rage. It was now or never. Nissa was safe from Kiora's spell, but she could collapse at any moment. Either Chandra would destroy every part of the titans with a single spell, or they would lose all of Zendikar, and lose the Eldrazi to the Blind Eternities in the process. Chandra let the fury grow. Fire crept from her fist up one arm and down the other. Her hair ignited. She thought of how she beheld Ulamog for the first time, as she was planeswalking back to Regatha—she thought of how its image imprinted itself on her vision even after she had left the plane. She couldn't wipe it out of her mind, and couldn't rest while it was still out there. 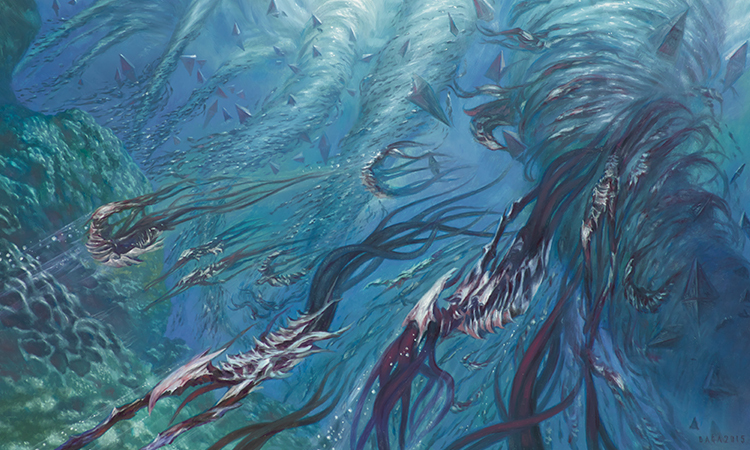 This is what the Eldrazi were—senseless, colossal horrors that made coexistence impossible. If they were released from Zendikar, they would follow Planeswalkers wherever they traveled, pursue life wherever it flourished, and end it all. Chandra knew this was what she and her friends had come to put to an end. This was their mission. It was their oath. Her hands burned white-hot. She looked up at the glowing green vines, the leylines of mana still pulled taut, binding the titans and attaching them to this world. She knew the leylines would break when she cast her blast of pyromancy. She willed herself hotter and hotter as landmasses spiraled down to earth, as the ground broke to pieces, as the sea boiled itself away. —and instantly she knew it wasn't right. 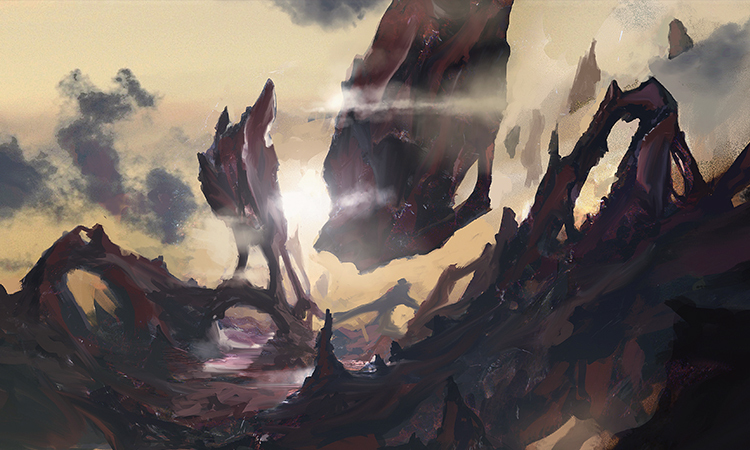 The torrent of fire touched the contorted Eldrazi mass, but it wasn't nearly enough. Her fire could barely scratch the titans even when they were finite, discrete beings. She couldn't burn their epic entirety now, any more than she could burn an entire plane. In the corner of her eye she saw one of the floating islands tumbling out of the sky, and she realized with a tiny part of her mind that it would barrel right into her. Simultaneously, she could see the glyph glow bright, down in the basin, as the fire streamed across the titans' bodies. It was all falling apart. The glyph would expire soon. Her fury would expire soon. They would all die soon. Chandra felt a hand resting softly on her shoulder. And then she felt the mana of an entire world streaming into her. The leylines. 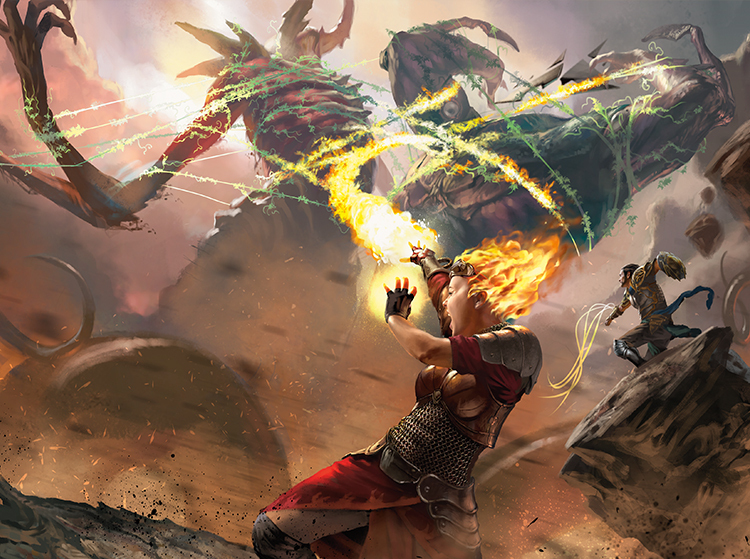 Nissa had been the focus for all of Zendikar's fury, and now, with Nissa's touch, that fury poured into Chandra instead. Chandra was the focus now, the nexus that connected Zendikar to the titans. She knew she couldn't hold their reins as Nissa had done. So she tried something else. And in her scream, she willed all of Zendikar's fury through herself, into her spell, into her fire. The leylines themselves caught fire, igniting like a spark hitting streams of fuel. Flames spiraled from Chandra into the streams of mana and branched out across the sky, following the paths of the leylines, enveloping the titans. Either Chandra was still screaming, or everything else was. The world flashed with a roar of apocalyptic orange, then went blinding white. Chandra's legs buckled, and she collapsed. There was thunder, and a hellish blast of heat, and an awful noise of the sky ripping into pieces. As Chandra's consciousness gave out, she decided it must be the sound of the world dying. Kiora couldn't see anything through the smoke. She pressed her gills shut, but she could still taste ash. Fires burned in the haze and puddles steamed. Flakes of ash fell, curling in little loops out of the gray above. She thought of the pale dust that Ulamog left behind when it consumed the land—was that what she was seeing? She wandered through the dense, opaque air in a weird silence, tripping over corpses of Eldrazi creatures and Zendikari alike. She couldn't hope. She couldn't pain herself with wonder. She searched the grayness, touching bodies. She helped a few survivors stand on their feet. Kiora stopped at one body. She recognized this one. It was the pyromancer, splayed out in the mud, her red hair spread over the turf. Kiora knelt down and pushed her over onto her back. The pyromancer lay there for a moment, then suddenly curled on her side in a spasm, coughing mud. When she finally raised her head, they exchanged a look, but Kiora said nothing. Kiora reached down a hand to help her up, but when the pyromancer took it, she grimaced and grabbed at her back. Kiora released her and let her lie there. Together they looked up through the falling ash. They saw two forms against the sky, but they were afterimages made of smoke, like the ghosts of fireworks. Between the dissipating towers there was a crease of blue sky. Gradually, others appeared out of the smoke. They gathered, walking, limping, trudging toward each other. Gideon and Jace. Tazri. Noyan, Drana, and Jori. And the elf. Nissa staggered over a mound of earth and sat on the ground all at once. Her eyes looked at nothing, but Kiora saw the elf's fingers dig into a patch of bare earth, where the glyph had been burned permanently into it. The land's crust was quiet now. Many landmasses had crashed to earth, but a few more floated silently by in the distance, ignoring gravity as they always had. Kiora watched as the other survivors slowly realized that it was over. There was no hurrah. There was no speech. No blanket of relief or gladness settled across the crowds. A few hands squeezed shoulders. Some questioning looks were exchanged. Heads were shaken, or nodded. Bandages were produced. Healing hands touched the wounded. Impromptu search parties were organized. Rescuers gathered around sinkholes or seawater-filled trenches. A few straggling Eldrazi were discovered and dispatched. Kiora put the bident on her back. She looked across the streaked, stained faces of the allies and turned toward the opposite horizon. She put the ruins of Sea Gate at her back and put her feet into motion—left and then right, left and then right. And she didn't stop walking for a long time.